Register Log In ECN Forum Forums Photos for General Discussion Where are the Counter Receptacles? A fine mess I've gotten myself into. Eight feet of counter space with one legal receptacle. 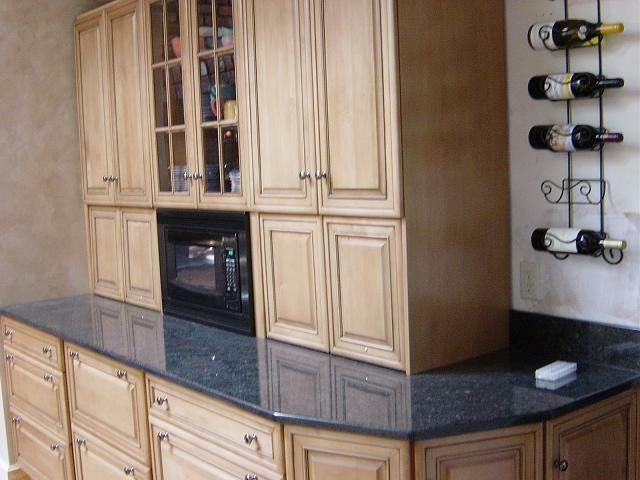 Other than the side wall there is no place for receptacles along the length of the counter. Customer is very picky about what she sees as the receptacle tucked into the corner shows. Plenty of receptacles with the appliance garages open but not technically satisfying the NEC requirements. Would you bend the rules like this? Gee that's a tough one Scott. Certainly makes life diffcult with so little wall space, it's a real problem with kitchen cabinetry. Looks like bending the rules slightly is all you can do in a situation like this. Lets see...we have appliances neatly stored, with recepacles within easy reach, but technically not counted because they're inside the cabinets.....remove the cabinet, and we're legal. This looks to be safe- and sensible. I think the code is wrong. I think the exclusion of the appliance 'garage' from consideration should be deleted from code. I'm saying that the unbending receptacle requirements can get rather Draconian in some circumstances, and there needs to be a prioritization of whether you're designing the house for the convenience of the NEC writers, or rather the NEC exists to guide a reasonable electrical installation for the house. I really don't think that the instalation missed the intent of the code. There are recepticals available in what (without a tape measure) I can see as applying to code. (except the cab doors, making an "Appliance garage") What defines an "appliance garage" anyway? Maybe some plug-mold (ooh I hate the word 'plug... mold') under the front edge of the counter-top? It would satify the code, and the customer need not see, or for that matter use them if they dont want to. On a simular note: Ever notice there are few if any plugs ever seen in those "Design" magazines, as they were not required in the the "display" they show. Maybe the code should require outlets be shown in the display too? This is a tough spot in regards to the NEC requirments. 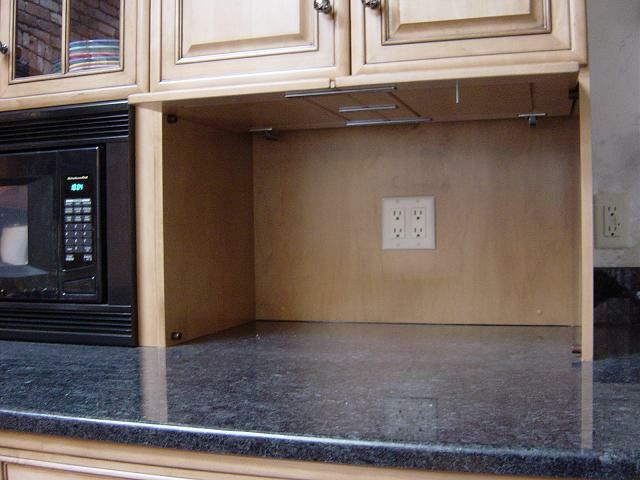 What about a receptacle on the wall to the left of the cabinets?